What's the Right Age to Start Wearing Makeup? This is a question that my father would answer with the words, “How long is a piece of string”. There is no right age to start wearing makeup, but there is the age that is right for you and your daughter. The question is – are you in agreement? It can be quite a wrench, when your daughter first comes into the room fully made up. Not dress-up made up, but as a young woman who is going to set out in the world. A step that frightens some parents, but at the same time a totally normal and necessary part of asserting independence. The teenage years are all about independence. Your child is moving from being under your wing, and following your rules, to making up their own mind and taking decisions with your advice and counsel. They are more influenced by others, and less by you – and this may hurt your feelings sometimes, that they value the opinion of friends or some random YouTuber more than their parents! Now that very few schools still have policies banning the wearing of make-up, it can feel that parents are left alone to decide when their daughter can crack open the cosmetics bag. Many girls start wearing light make-up on a regular basis when they are around 12 or 13 years. Talk to your daughter about how you feel, and come to an agreement that you are both happy with. For first make up, try a powder rather than liquid foundation, some blusher and a lipgloss. Some girls may want to add eyeshadow and mascara, or a tinted moisturiser (BB Cream). If you can persuade your daughter to hold off on heavier make-up, her skin will thank you. Talking of skin care, to ensure that her skin doesn’t suffer from the cosmetics, get her into the habit of cleansing her make-up in the evening before bed. One of the best ranges that I’ve found for my daughter is the Oy! Green People Teen Skin Care range – despite the rather cringe-worthy name! The cleanser/moisturiser is gentle on her skin, and has definitely made a difference to her skin. The main influence on girls of this age, when it comes to wearing make-up, isn’t parents or school but friends. Peer pressure can be immense, with girls feeling that they have to wear make-up to fit in. And it isn’t just the girls – my daughter told me last year that a boy in her class had asked her why she didn’t wear make-up. I admit that I did a silent air punch when she told me her response was, “I don’t need to. I’m pretty enough without!” He didn’t know quite what to say to that! Not every girl is confident enough to respond in this way (I’m not sure I would be!). Talk about this with your daughter, and discuss possible come-backs, so that she feels more confident about defending her decision. One recent development is the use of “contouring”, for which we can probably pin the blame onto the Kardashians. Originally designed for use on the catwalks or glamour photoshoots, it has become popular with young women, with thousands of YouTube videos showing how to get the look. I don’t know about you, but this seems to be an AWFUL lot of work – even if it’s not meant as a daily make up routine. This doesn’t meant that wearing make-up is bad, or that contouring always looks awful. It’s great to encourage girls to experiment, and develop their own sense of style – and that’s the point. Their OWN sense of style, not an identikit copy of the Kardashians or any other celebrity. YouTube is full of videos showing how to put on make-up, and your daughter may well be a lot better informed than you are on the latest trends. Have a look at your daughter’s favourite YouTubers and see what they are recommending – forewarned is forearmed! 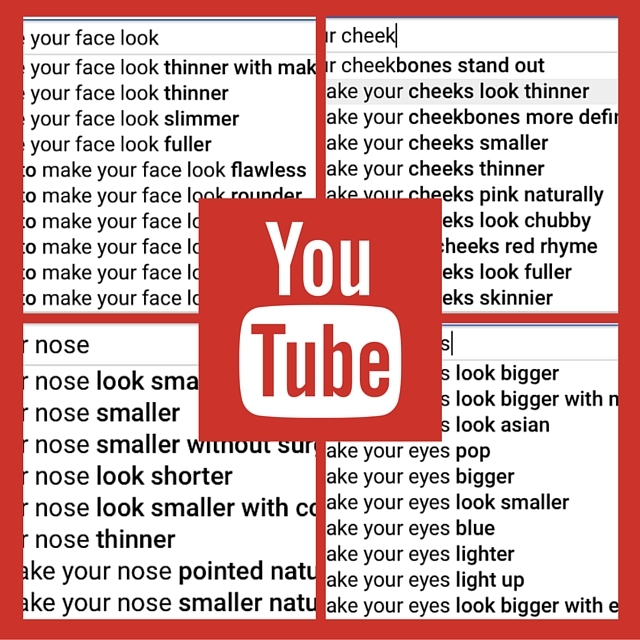 For all the magic promised by YouTube, you can’t actually make your eyes larger, your nose smaller or your eyelashes thicker – there are some tricks that will help them appear so, but that’s all they are. Encourage your daughter to see her WHOLE self, and not to concentrate on one bit of herself that she doesn’t like. It’s also a good idea to talk about accepting the face, body and hair that biology has dealt you. At some point in my life I realised that the time and money I was spending artificially straightening my hair was useless, and that I should accept, nay embrace my waves and curls. As I live in Scotland, this also meant freedom from the worry of a unexpected rain shower ruining my work. There’s no shame in helping nature along a little bit, but as anyone who has ever had a disastrous perm knows, somethings are just not to be! Going out tonight? For many women, this means time in front of the mirror with an array of cosmetics. Minutes, sometimes an hour or more, and even the occasional professional consultation may be a part of the process of enhancing attractiveness. Within our bag of tricks, we typically find similar products—foundation, eye shadow and liner, blush, lipstick, etc. But where did this particular assortment come from? Is there a psychological basis for the makeup we use today? And if so, can we use this to our advantage? Rather than asking “should women wear makeup?” while acknowledging that many women do, might we instead try to figure out why we wear the makeup we do wear? Make-up is a social norm for many women and such an intrinsic part of our lives that we tend to forget quite how much time and effort we take to put it on, top it up and take it off, day after day. It’s somehow accepted that putting on make-up (for women, at least) is just part of Making An Effort – indeed, the idea of going without is considered so controversial that it formed the basis of the #nomakeupselfie campaign on social media earlier this year. We meet six women who have chosen to shrug off these unwritten rules by going without make-up on a regular basis. Lots of people get comments on their appearances that they never once asked for. But it feels like girls who choose to wear makeup get a TON of those unsolicited comments. Which is weird, because you might not guess that applying makeup to your own skin would have, like, zero effect on anyone else. But, nope. Apparently, it has life-altering effects, which compels them to speak up and say something to you. And, yes, it’s usually something stupid.